The Orban 424A, manufactured in the late seventies, is a dual mono or stereo linkable channel gated compressor/limiter and de­esser. To many engineers, it has been considered one of the best broadcast & production units for many years. Just like here at Studio 11, the Orban 424A can still be found in many radio stations and studios all around the world today. The 424A is a VCA compressor that works a little differently than most standard compressors. The input/threshold knob acts just like the urei/universal audio input know­ it’s a level control that controls the input signal to the compression amplifier. The attack and release times are program dependable which means it’s kind of the same as having the unit in ‘auto’, but the unit is adjustable within the ‘auto’ setting. When the attack setting is under 3, the Orban acts like a peak limiter and compressor. With higher attack settings the 424 A acts considerably slower. There is not much of an in between with the attack settings. There’s a switch to change the shape of the release curve from linear to exponential (curved, log release). The ‘gate’ function on the 424 A isn’t really a normal input gate. Its a compressor release ‘hold’ to prevent pumping of hiss and to smooth out post compression dynamics. The de­esser setting receives its signal pre compression and only compresses frequencies down to 5 K. This function is not only really useful with both lead & background vocals, but for drum cymbals as well. 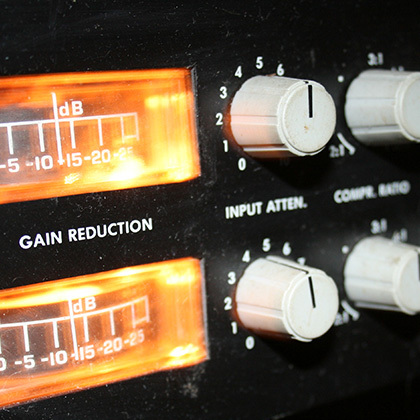 The output trim controls the amount of drive to the VCA compression amplifier. It’s not an output control, per se, but it’s a post­attack and release amp way to increase or decrease amplifier drive. Here at Studio 11, we found it can be particularly useful operating in parallel on a drum mix or master mix, however when it comes to mastering the 424A can tend to add a little more color than what is needed. DO YOU WANT THE SOUND OF THE ORBAN 424A ANALOG COMPRESSOR LIMITER ON ONE OF YOUR INDIVIDUAL TRACKS?